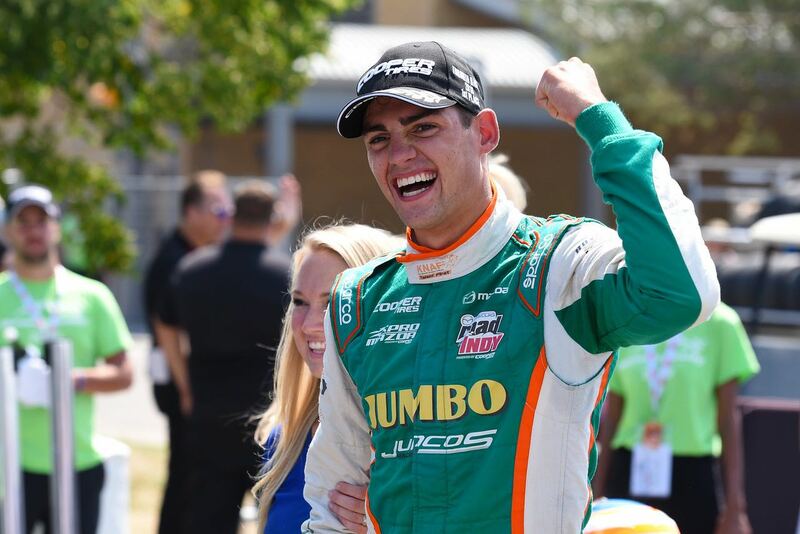 KNAF Talent First car racing talent Rinus VeeKay has dominated the sixth round of the Pro Mazda Championship Presented by Cooper Tires in commanding style by claiming two wins on the street circuit of Toronto. The 17-year-old driver from Hoofddorp in the Netherlands impressed in qualifying with two pole positions and was in the lead from start to finish in both races as well. With his double victory, VeeKay’s third and fourth win of the season, the Juncos Racing driver closed the gap to the leader in the championship to seven points. Taking into account that each driver has one scratch result, the gap is only one point. “An absolutely great weekend. Everything was in place,” said VeeKay after his double victory and engulfed with compliments by everyone who witnessed his great performance. For the sixth round of the championship the Streets of Toronto was host to the Pro Mazda Championship Presented by Cooper Tires . After some races on road courses and an oval, the championship returned to the type of circuit the series started with in St. Petersburg, a street course. KNAF Talent First car racing talent Rinus VeeKay has great memories of street circuits as the 17-year-old driver from Hoofddorp in the Netherlands won both races during the opening weekend of the season on the streets of St. Petersburg and had two podium finishes in last year’s USF2000 races in Toronto as well. The Juncos Racing driver topped the time sheets in practice, to claim the pole position for both races in qualifying, the first sign of more things to come during the race weekend. The first race of the weekend was dominated by VeeKay in commanding style. The Juncos Racing driver had a great start and took the lead, but saw his advantage disappear due to a full course yellow. Twice more VeeKay had the best start from behind the safety car only to see his lead of several seconds disappear with a full course yellow. With eight laps to go, there was the third and final restart from behind the safety car. VeeKay once again drove away from the field and underlined his superiority by resetting the lap record three times in the final three laps of the race. With 1:07.841 seconds VeeKay was the only driver to break the 1:08.00 seconds barrier, to finish 3.5 seconds clear of the number two. Starting from pole position VeeKay had a great start again in race number two, and created a gap of almost four seconds in only three laps, until there was another full course yellow. At the restart the Juncos Racing driver was in a class of his own again and took advantage of the fight for second position to lead the field with a margin of over four seconds. But with only a few laps to go the safety car once again disrupted VeeKay’s dominant performance. This final safety car period turned the 45-minute race into a two-lap sprint to the finish. But once again VeeKay made no mistakes and won his second race of the weekend with a margin of just over half a second. With his double victory, his third and fourth wins of the season, VeeKay closed the gap to the leader in the championship from 46 to 7 points. But taking into account that each driver has one scratch result, the young Dutchman is only one point short of the lead. “This was an absolutely great weekend. From the very first moment we hit the track, everything was perfect. Juncos Racing did an excellent job in preparing the car for this weekend, but also during the weekend. We were very dominant all time, but the safety car periods made it difficult to stay focused. I’m extremely happy to be back in the title race,” said VeeKay, who was engulfed with compliments after his great performance.